HeavenSent Bulldog Rescue Help Wanted. Spotty loves his new home in Philadelphia. Would you like to help? We'd LOVE it! We are not a paid network, nor do we operate under any type of charitable program providing funds for veterinary care. The money that is spent on all veterinary exams, innoculations, medications, spays/ neuters, as well as life-enhancing and life-saving surgeries is derived TOTALLY from donations and our occasional fund raisers . We need all of the help we can get and every donation and helping hand is appreciated from the bottom of our hearts. 1) We have a CRITICAL need for temporary homes. If you can not foster a dog in your own home, maybe a relative or neighbor will help you "share the care". We will mentor you, CLICK HERE to find out how! 2) We always need help with applicant's home checks, transportation, and visits to meet and take pictures of dogs who are being surrendered. Please email HSrescue@aol.com to join our Volunteers. 3) Donate - we ALWAYS need money! We accept personal checks and Paypal donations. More information can be found here. 4) Shop with us! Visit our store to purchase HeavenSent Bulldog Rescue merchandise or use our link to sign up with iGive.com and donate for FREE while you shop online! 5) Do you have access to pet supplies or maybe have extras of your own? We are always in need of many dog related items (see the list on the left). 6) Support spay /neuter programs, and discourage ANYONE you know from buying pups online and from pet shops. 7) Link to us!! You can add our link to your website or in your "signature" section of your email and any message boards your particpate in. Not only does this help spread the word but it helps internet serach engines find us.. and that helps bulldogs find their forever homes! Banners and buttons of all sizes and linking instructions can be found here. 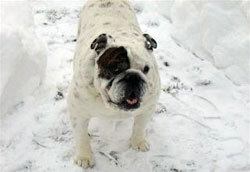 All of the donations are used for the care of our rescue bulldogs. Thank you for supporting HeavenSent Bulldog Rescue!